Gene-environment interactions (GxE) are known to play an important role in common disease risk and biomedically-relevant traits. 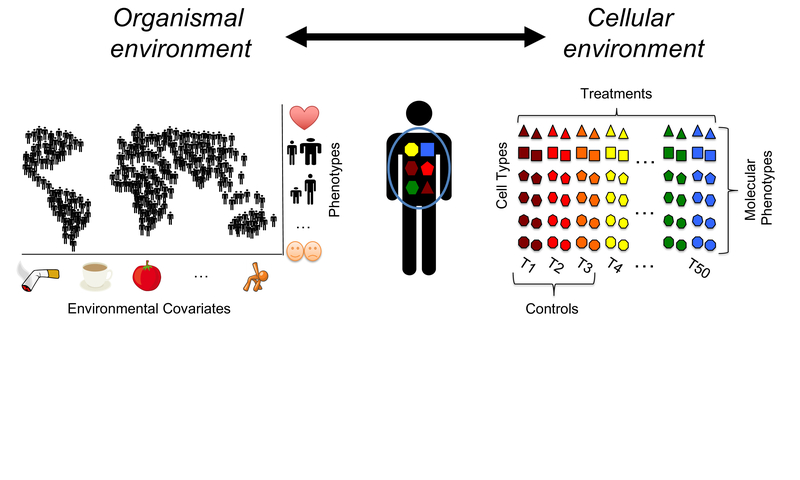 However, quantifying the extent to which the environment can modulate genetic effects on human quantitative phenotypes is challenging and remains largely undefined. We have investigated the transcriptional response to 50 treatments in 5 different cell types and 15 individuals (for a total of 960 RNA-seq samples). We discovered 1,455 genes with allele-specific expression (ASE) (FDR<10%) and 215 genes with GxE.We demonstrated a major role for GxE in complex traits. Genes with a transcriptional response to environmental perturbations showed a 7-fold higher odds of being found in GWAS. Additionally, 105 genes that indicated GxE (49%) were identified by GWAS as associated with complex traits. Examples include GIPR-caffeine interaction and obesity, and LAMP3-selenium interaction and Parkinson disease. Our results demonstrate that comprehensive catalogs of GxE interactions are indispensable to thoroughly annotate genes and bridge epidemiological and genome-wide association studies.